I don't know if anyone does a "Use Your Old Stuff" challenge but this would fit for that as well. I started with this Occasionally stamp set from SU! I bought it off E-bay a couple of years ago but it goes back to 2004, probably a SAB or hostess set. 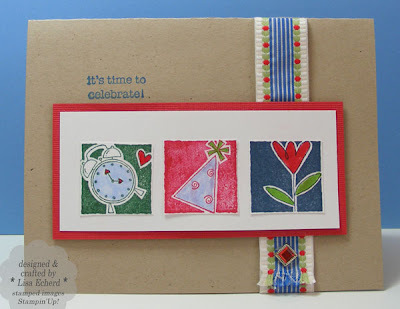 For a color scheme, this ribbon from my stash inspired the use of red, blue and green. Since I wanted to color in the images and just happened to have some Staz-on ink in these colors I hadn't used in 2 years, it was perfect. I always feel so good when I use older supplies. The little angel on my shoulder preens ...just like the little devil beams when I order new supplies on-line. Cute cute card, Lisa. I love that ribbon, too, and that you pulled your color scheme from it. And yes, I know what you mean... it does feel good to use some of the old stuff now and then.